For those of you who have been keeping up with me, you know that I am currently in Adelaide, Australia, playing basketball. I’m really enjoying my time here and think that Adelaide is the perfect introductory city to Australia and some of what it has to offer. I live a 15 minute drive from the ocean, there are plenty of food options (cool cafes and restaurants), and there is so much nature that there are always places to escape to when I don’t want that city feeling. Yet, when I want the commotion, I’m a 15 to 30 minute drive (depending on what area I want to go to) from popular and busy streets filled with people, shops, entertainment and more. It’s the perfect city for a low key person like myself who enjoys the quiet as well as getting out, exploring and undertaking activities (solo or with friends). 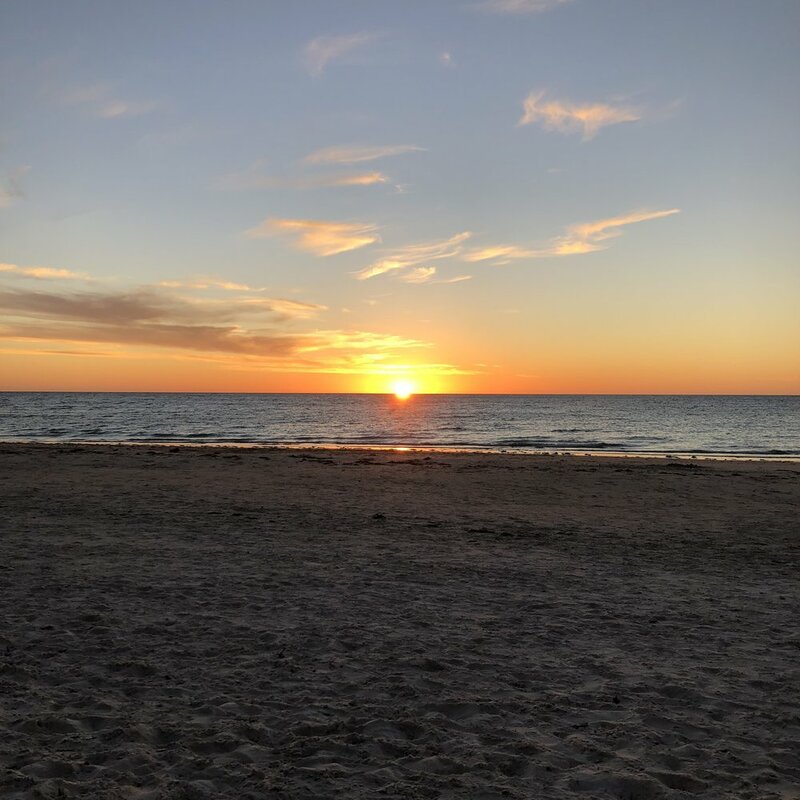 I recently went exploring solo during one of our off days, opting to stay local and see what Adelaide had to offer. My morning began with me checking out the Adelaide Himeji Garden. Information on the details of the garden can be read on a large plaque before entering the garden. Here is a brief snippet of some of the interesting facts I learned: The Himeji Garden actually celebrates the sister city relationship between Adelaide and the Japanese City of Himeji, which is located 480 km from Tokyo. The garden was designed based on Japanese garden principles, but they obviously had to make adaptations based on the climate and the availability of plants. This particular garden represents two Japanese garden styles (I didn’t even know this was a thing!) - the ‘senzui’ and the ‘kare senzui’ styles. When you first enter the garden there is a bowl present filled with water and guests are encouraged to wash their hands before entering. The lantern was a gift from the city of Himeji to Adelaide, with the inscription reading “For the friendship of two cities”. Lastly, there is a tea house built within the garden. 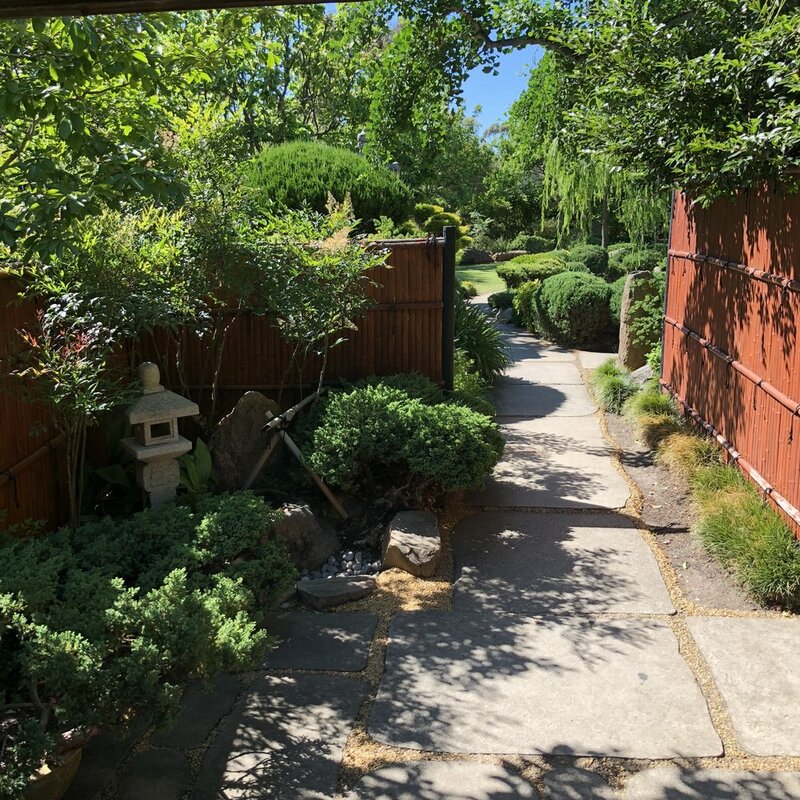 The calm, peaceful vibe I felt upon entering the garden was the same feeling I experienced when I explored the Japanese Tea Garden in San Antonio. Although the space was nowhere near as big, the effect of leaving the city and walking into serenity was still very evident. The garden had a nice pond covered in lily pads, but instead of seeing vibrant koi fish swimming beneath the surface, I saw a duck floating on top, drifting peacefully with the direction of the water. There was a (very) mini waterfall and a lot of greenery from the grass, to the trees, to the bushes and the stems of flowers. I was in the city, but felt this beautiful oasis surrounding me. Since being in Australia, I have acquired a new appreciation for flowers. I see them everywhere, both where you expect flowers to grow and also in the least expected places. They are vibrant in colors, sometimes odd in shape and they add a pop of color to their surroundings. There were plenty of flowers in the garden, so I snapped some pictures of them for you to enjoy! If you’re into nature, need a place to escape within the city, are looking for a place to trigger inspiration, or enjoy going on peaceful walks, and so on, visit the Himeji Garden. Later that day, I decided to check out Rundle Mall. Rundle Mall is an outdoor pedestrian mall, no cars have access and there are numerous stores on both sides of the walkway. If you enjoy shopping (I don’t, but I did buy a pair of Lulu Lemon leggings and a cute top from a store’s name I’m currently blanking on) while simultaneously enjoying warm weather and street performers, check it out! After walking the entire length of the walkway, seeing all the stores of the mall, my stomach was growling and I knew it was time for some food! I was walking back to my car when I noticed a sign in a cafe for waffles, and that waffle looked delicious, So, given I have a major sweet tooth, I ventured in. Yes, I am well aware that this is not a healthy meal or a proper meal. And yes, I am a professional athlete, but I eat healthy meals 95% of the time, and this was not going to be my only meal of the day. The name of the cafe was Steven Ter Horst Chocolatier. I ordered a hot chocolate and their Belgium waffle that contains chocolate chip pieces with a scoop of vanilla ice-cream drizzled in salted caramel. Let me tell you that it was heaven in my mouth - it was so good I was kicking myself for not ordering the double serving. It was a little pricey, although, I think food in general in Australia is pricey. For my waffle it cost me 14 AUD and if I wanted the double it would have cost me 22AUD. It was worth every penny though. 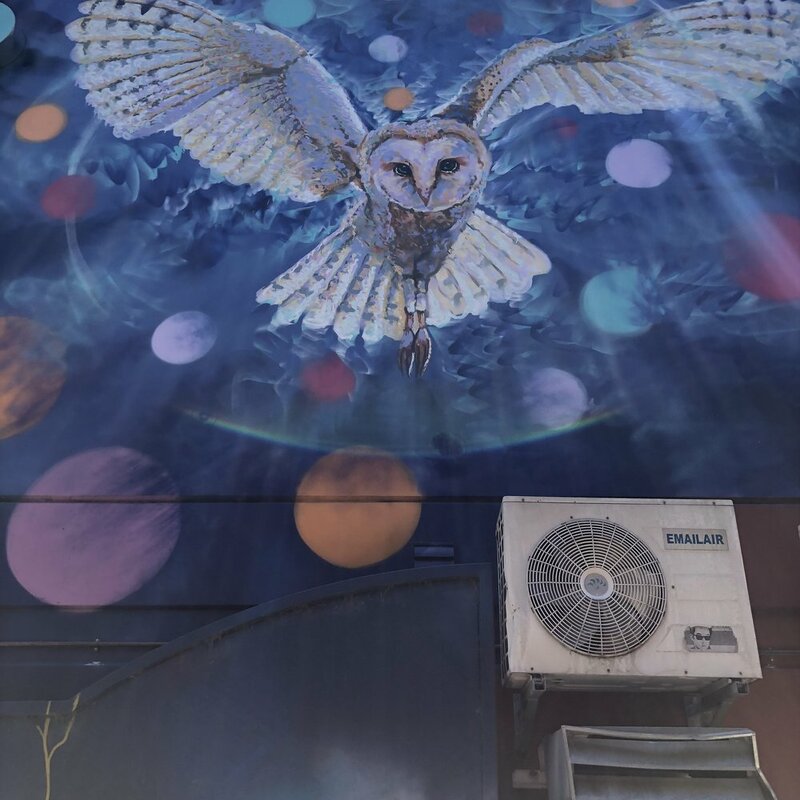 I also wanted to include three street art pictures I noticed when I was wandering the area around the Himeji Garden, before venturing to Rundle Mall. I love art - as those who know me are well aware - so I wanted to share with you some of the creativity I stumbled upon! After my exploration in the city, I was not ready to head back home. I still needed a proper meal, so I decided to go to Jetty Road on Glenelg beach where I had a burrito bowl from Salsas. I should note that I love, love, LOVE Chipotle. It’s cost efficient, relatively healthy and the food portions never disappoint! Why do I bring up Chipotle you ask? Because they do not have one here in Adelaide - I don’t even know if they have one in Australia for that matter. So Salsas has become my Chipotle option in Australia. It’s Mexican food and, unlike Chipotle where you can pick and choose your ingredients, Salsas has pre-made bowl and burrito options. I usually just order a veggie bowl, add chicken, and swap out the chipotle mayo for ranch. It’s no chipotle, and the food portions are smaller, but it gets the job done. I spent the next couple of hours walking the area, starting on the walking path before taking my shoes off and walking along the shore, letting my feet get wet by the incoming tide. The view of the ocean never gets old, the sea felt refreshing on my skin and when I stopped to look out at the never ending sea, I could feel my heals sinking into the sand. The sun was lowering (sunset was at 8 pm according to the weather forecast on my phone) and I wasn’t ready to head indoors just yet, so I made myself comfortable on one of the larger rocks and sat for 35 minutes waiting for the sun to set. 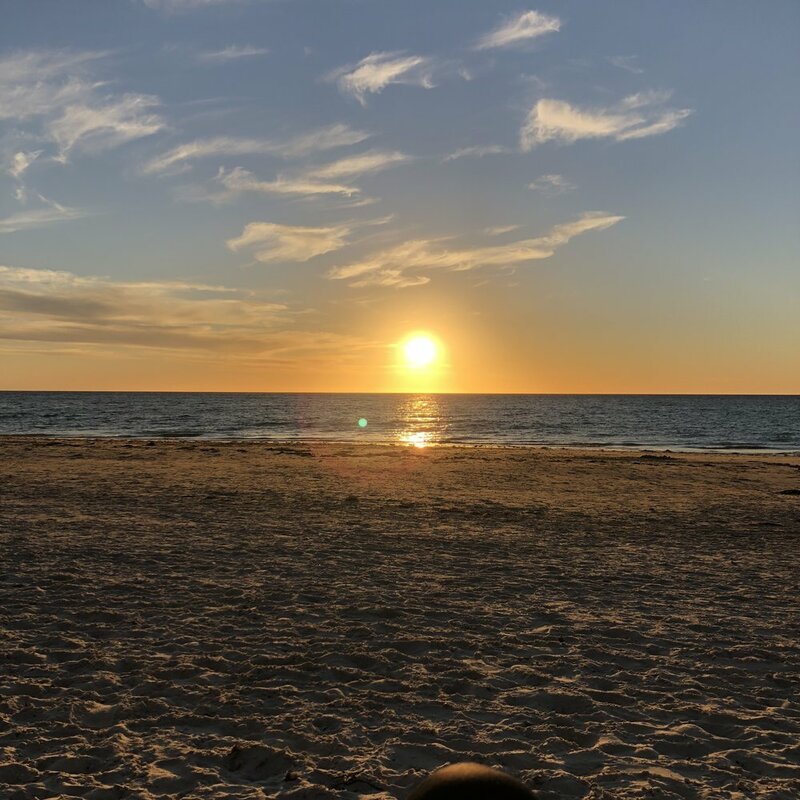 In my 27 years, I have never sat down and watched the sunset. I’ve caught different parts of it, and seen the final moments numerous times, but I have never watched the entire process. At first, it seemed like the sun had no intentions of setting. It descended the night sky quite slowly. However, once it hit the sea line, it seemed as if the sun was in a hurry to disappear. It was so cool to watch the sun, this bright white light in the sky, gradually change to yellow and then a bright orange while it was ducking beneath the sea line for the night. I think my favorite part might have been how the sky changed after the sun had vanished. It was like God had taken His water color paint set out and was using the sky as His canvas. It was beautiful! He’s painted how many hundreds of millions of sunsets? Yet they always seem to capture our eye, and never look the same! Talk about a lovely end to a great day. Have you ever sat and watched a sunset in its entirety? What thoughts cross your mind as you watch God paint the sky?